I knew about the gray hair, and the wrinkled, saggy skin. Even about the hair in my ears, which I’d have to shave regularly. I was prepared for losses in hearing and vision, but I’ve been largely spared those so far (though I have had cataract surgery in both eyes). I missed the bulletins about declining acuity of smell and taste, however. I knew there would be medical problems, but I wasn’t prepared for their immensity. How I would become not so much a person as an accumulation of dozens of conditions, variously painful, disabling, and life-limiting. How so much of my remaining time would be taken up with medical investigations and treatments, so that it often seems that the only point of my life is to keep on living. Worn to a nub, but still scribbling. This entry was posted on December 27, 2018 at 7:55 am and is filed under Language and the body, Linguistics in the comics, My life, Puns. You can follow any responses to this entry through the RSS 2.0 feed. You can leave a response, or trackback from your own site. Whoa! You’re only a year older than I; but I’ve somehow managed to escape some of these infirmities of the elderly so far. No secret, maybe just good genes. 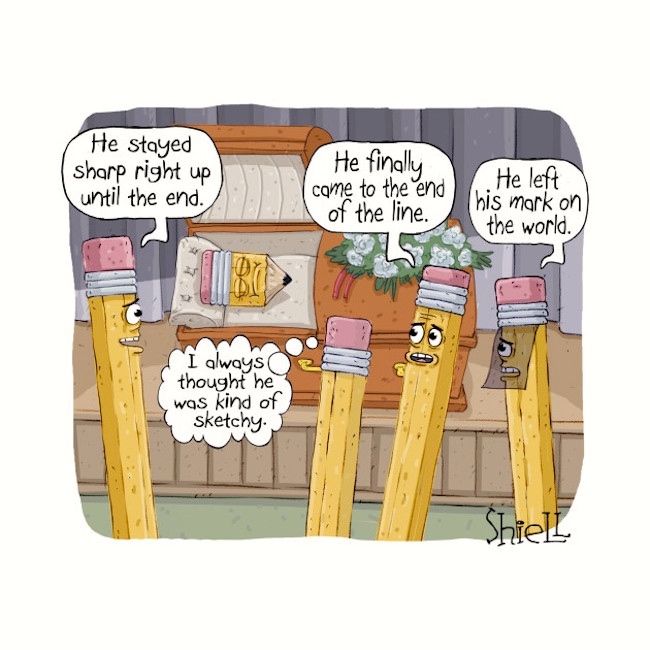 Anyway, in the meantime, keep your pencil sharp, Arnold! May your shadow never grow less.